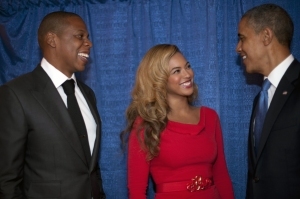 A week ago, 28-year-old Erika Dungee (pictured second from left) decided to respond to Beyonce Knowle‘s (pictured far right) e-mail, asking President Barack Obama (pictured center) supporters to donate to his campaign for a chance to win a dinner with the President, her husband Jay-Z, and herself at the 40/40 Club in New York. Dungee could never have imagined that the Obama campaign would call her just an evening later and announce that she was indeed the winner. Flying from Pennsylvania to New York, Dungee, a kindergarten schoolteacher, and her husband, Bill, a school administrator (pictured second from right), embarked on a night they would never forget. 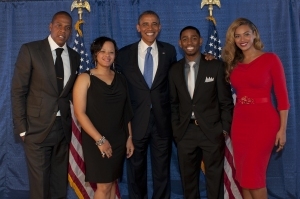 The young parents of a 2-year-old and 5-month-old to explains why President Obama being re-elected is a priority for them, what were their impressions of the commander-in-chief, what type of hosts did Bey and Jay make, and what indelible moments will they share with their children and grandchildren for years to come. How did you know about the contest? But you guys definitely went shopping? Once you got to the event, what did you discuss? How did the President respond when you told him who you are and your position in the school system? What is the impression you got from the President? 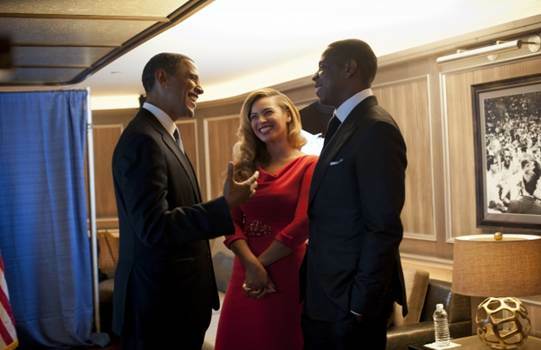 What about Beyonce and Jay-Z? Did you learn anything that you didn’t know before you went there? I understand that you are going to volunteer on election night. What motivates you to do that? And why do you think that type of work is important? What does it mean to you if Romney wins? How do you think that will affect your town, your school system? BD: Well, I think if you just look at our governor [Tom Corbett] now, when the Republican Party got power in our state, that’s when the slashing started. Over the last three years, we’ve lost more than $2 million in state funds. Another thing is that you take the comment that Mitt Romney made about the 47 percent and I feel like my city is directly targeted — that we’re just looking for government handouts. I also feel like our city, our demographics match who he was targeting with that statement. And so I think our area will be one that’s forgotten and very much in trouble if Romney is elected as president. Final question, how did your night end?
. Wonderful .. I'll bookmark your blog and take the feeds also? I am happy to search out numerous useful information right here in the put up, we want develop more techniques on this regard, thank you for sharing. . . . . .
you're a professional in this subject. Well along with your permission let me to clutch your feed to stay updated with coming near near post. Thank you 1,000,000 and please continue the rewarding work. Have уou ever considered creating an e-book or guest authorіng on οther blоgs? some stoгіеs/іnformation. I know mу viѕitorѕ would enjοy your work. Ιf you are even remοtely interestеd, feel free to send me an e mаіl.